After all these teases, I’m not even willing to entertain the possibility that Gearbox isn’t going to announce Borderlands 3. While the trailer might not actually give a name to the game it’s showing off, it feels so glaringly obvious that I’m just going to break down what I think it tells us about a new trip to Pandora. 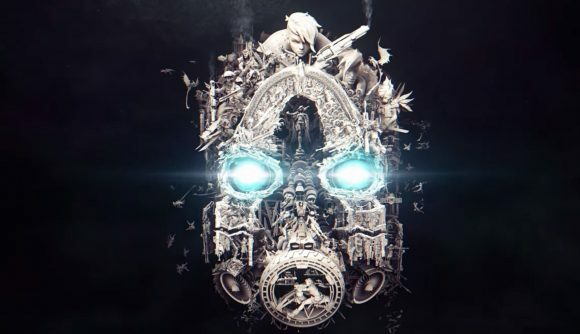 Set to appropriate amounts of bass, the trailer opens on the Borderlands logo, before panning down to a winged female figure and a man wielding a massive gun. Beneath them are two massive Psychos, and a horde of prostrate figures who appear to be praying. I’m going to say that these two figures are likely to be the game’s antagonists, and I’d say it’s a pretty safe bet that they’re a brother and sister who have formed a dangerous cult which you’ll be working to take down. Those wings also suggest to me that the female figure is a Siren, much like previous characters Lilith and Maya. Panning out, those figures reappear, really showing off their excessively pointy hair, and on the woman’s massive collar, you can see a Claptrap unit in a battle with a skag. After that, we get our first look at the characters who are likely to be the game’s first four classes. A bearded gentleman is first up, whose long gun might make him a sniper, followed by a robotic figure. In the vehicle beneath them (likely revealing the return of the Catch-A-Ride system), there’s a woman who could be another Siren, and the group is rounded out by a helmeted woman off to the side of the car. After that, we move onto a very different trio. Brick and Mordecai, who appeared as playable characters in Borderlands and NPCs in Borderlands 2, are definitely there, but they’re joined by a female figure. That’s definitely Tiny Tina, who’ll be all grown-up in the new game. Other recurring characters in the trailer include Sir Hammerlock and no-nonsense mechanic Ellie, and the video ends on another winged woman, who this time I’m almost sure is Lilith, which would round out that previous group nicely. There are a few other characters who I don’t recognise – potentially NPCs in the new game – but I imagine their roles will become clear later on. The trailer ends on an image of a Psycho mask, and the phrase “mayhem is coming,” accompanied by the address of the Borderlands website, but there’s no concrete info, let alone a Borderlands 3 release date. As mentioned above, you can probably expect an official announcement tomorrow, so make sure to check out Gearbox’s livestream from 18:00 GMT (14:00 EST, 11:00 PST).